Another "certified Turkish" recipe from my mom: karnıyarık which literally translates as "split belly." Karnıyarık is widely made and dearly loved almost in every part of Turkey. But by going over the ingredients and cooking method, I believe it's from southeastern and eastern Mediterranean regions of Turkey. I must warn you; this is not a light dish, but it is absolutely fantastic and if you haven't had karnıyarık before, it will change your ideas on eggplant dishes. Enough said to advertise eggplant. There are a couple things to be careful about when you're cooking with eggplants. Buy eggplants right before you cook and pick the firmer ones; eggplants tend to get soft in the refrigerator. And for this dish, do not use huge American eggplants. Try to find cute little ones or Asian eggplants. -Once they're fried, first soak the excessive oil by resting them on a paper towel, and then place eggplants on an oven dish. -In a deep frying pan, heat olive oil. Add onions and stir for 3-4 minutes. -Add ground meat. Cook until ground meat soaks all the juice it lets out. -Add diced tomato. Stir until cooked. Turn it off. -Add chopped parsley, salt, and pepper. Mix well. -With the help of two spoons, slit eggplants into two. But leave the tops and bottoms attached. -Stuff eggplants with ground meat mixture. -Place a slice of half moon shaped tomato and a green pepper on top of each split belly eggplant. -Pour 1 cup of hot water on top and bake them in preheated oven at 400F until green peppers are nicely baked. Another eggplant recipe with parsley for Weekend Herb Blogging which was founded by Kalyn and is hosted this week by Katie of Thyme for Cooking. 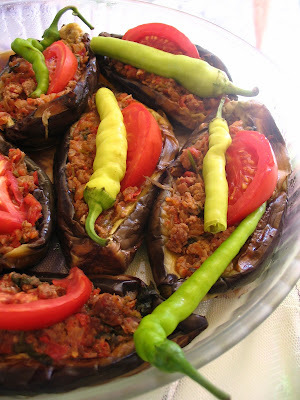 0 Response to "Stuffed Eggplants (Karnıyarık)"